Momma Mia Moments : Sunroom Makeover: Part 2! I would say, given I love my little ones and love to talk about them, that this blog is a Mommy blog :) ,source for my favorite DIY project finds for the home, my own DIY projects for the home (both indoors and out), projects for kids of all ages, occasional thoughts on current events, crafts and patterns, and most anything else that I find a great interest in that comes across my path. Thanks for visiting and hope that you enjoy!!!! Well, with life’s chaos this second part of the makeover took a touch longer than planned! :) Since our third little ones arrival we have found our new normal and it makes me smile. My oldest little guy helped me with this final project and all of the kids just love the end results!!! It’s a wonderful extension of our house that kids enjoy no matter what the weather outside. It’s just perfect for them!!! The initial project started with pieces of rug remnants on the floor and those great plastic curtain things that rolled down over the windows, you know the ones I referenced loving so much in my first post! Not actually... Anyway, part one removed all of the window coverings and I put curtains on roping around the entire room. The rope just has a really neat look I think and it’s very cost efficient. Rods can become so expensive and I’m also limited in actual sturdy space to mount something to in the portion of the wall I was working with so this concept was best for my space limitations as well. Anyway, moving on, part two gets rid of all of the ugly carpet remnants!!!!! Yes!!!!! 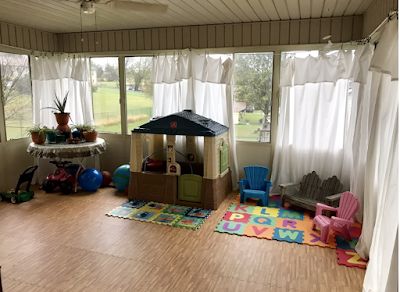 The new floor is an excellent option for the kiddos right now and it looks great as well! It actually insulates the room a bit more too! I can pull up a piece if it gets messed up and it’s a cushioned space so it’s safe for my sweet babies and their heads if they take a tumble! Also, easy cleanup as I can just sweep or wipe down the floor!!!! Can you tell I love it?! Before and after a below. It only took a few hours total to pull up the old carpet and cut the mats to fit the space! NOW, the final product!!! Whew! Much better! I hope you enjoyed being a part of this makeover and that this space inspired you as well! This is such a big transformation. Very inspiring to such a space changed and in such a cost effective manner. New project postings would be welcomed! We would like to see what you’ve been doing! Awesome Upcycling / Beautiful DIY Furniture Makeovers! Proud mommy, wife, sister, and daughter! 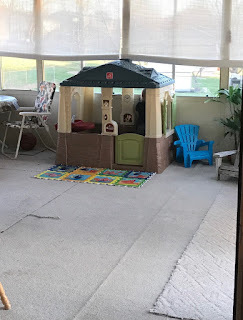 Hoping to share and build this blog as a place of uplifting words, encouraging thoughts, money saving DIY projects for around the home and everywhere else with the object of saving money and really just having fun!!!!! Visit often, comment and suggest, build and we will grow together! Excited to start this new project!